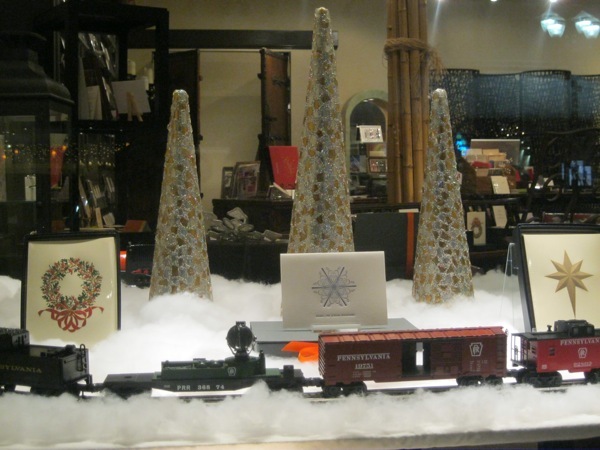 Holiday cards at the Barrington stop – Write with us! When I thought about the window decoration for this holiday, I was stumped. What to do? Last year I enjoyed designs by Aaron Potts NYC. Those tall ladies in the window, dressed in holiday gowns made of his greeting card line, stopped traffic. So this year with the celebration of my 5th anniversary I wanted to do something a little different. When Graphic Image, the makers of fine leather desk accessories mentioned I was listed as one of their only stores in Illinois, I thought that was cool. And then I realized I have many products that are not offered in other places, not even Chicago! So maybe I can bring some of the Chicago city shoppers to Barrington. And what better way than the Metra – take the Northwest Line and get off at the Barrington stop. Then it hit me! A train….but I don’t have the Metra line, I don’t even have a train set….but my husband Jesse does! But he couldn’t part with his collector’s pieces, so he set me up with my own Pennsylvania freight line! And it’s “bringing in all the great products from everywhere”, to Illinois, just to TT Patton. In the window, Dempsey & Carroll engraved holiday boxed cards. Other designs in the shop if you just need a box or two of 10 cards or even singles. Another favorite is in the window, bell’INVITO letterpress snow flakes. But there are other great holiday greeting cards by Aaron Potts NYC and Oblation Papers and Press.